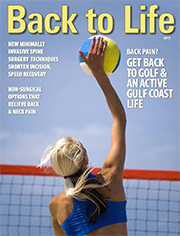 Thank you for your interest in Northwest Florida Spine's Back To Life Journal. We are currently developing a new Back To Life Journal. If you would like to be one of the first to see the new journal, provide your information below and we will email an e-copy of the Journal as soon as it is ready. To subscribe to our Back to Life Journal featuring information on the latest treatment options and home remedies for back and neck pain please fill out the following form.